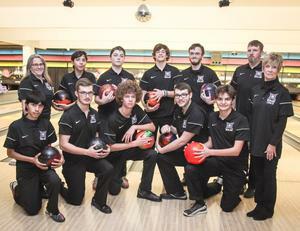 HHS boys bowling team is state bound! The team took third place in the District Tournament at Kellogg Bowl in Milwaukie. The following boys qualified for the State Tournament and will participate at the Firebird Lanes in Salem, on February 23-24. Back row: Assistant Joanne Chapman, Kacen Shelley, Darius Jones, Spencer Juul, Dylan Baher, Assistant Kyle Shelley.